Home > Travel & Leisure > Books & Reading > Cookbooks > Cookbook > More Please! Manu’s latest cookbook, More Please! is co-authored with his fiancée, Clarissa Weerasena, and it’s a collection of all their favourite meals; the kinds of delicious, no-fuss foods Manu and Clarissa create at home every day. Drawing upon their rich cultural heritages, Manu and Clarissa’s recipes are an adventurous foodie’s delight, exploring French cuisine, as well as Chinese, Malay and Sri Lankan influences. You’ll find meals that are perfect for whipping up on busy weeknights as well as special occasions when you’re out to make an impression. These incredible recipes will leave you wanting more…please! 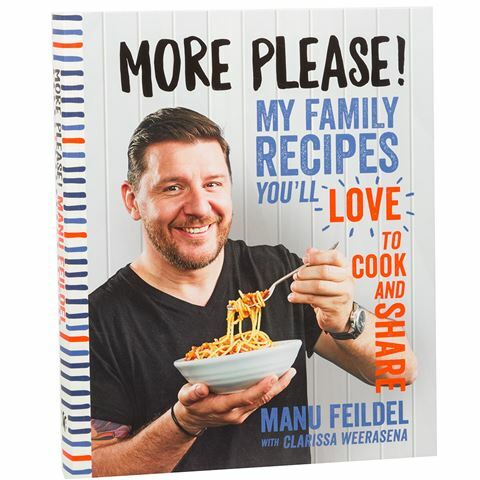 Recipes by Manu Feildel and Clarissa Weerasena.